In 1964, Barry Goldwater quipped about nuking the Kremlin men's room and equated Medicare to giving old folks free resort vacations, cigarettes and beer. Just before Lyndon Johnson strolled to victory that November, Gallup found that 46 percent of Americans viewed his Republican opponent unfavorably, with 26 percent of respondents into the "highly unfavorable" camp. For five decades, Goldwater's been the most unpopular major-party presidential candidate ever—a record that seemed unbreakable. Well, they used to think nobody would ever hit 62 home runs in a season either. By Gallup's latest reckoning, back in June, exactly half the American public views Hillary Clinton unfavorably, 33 percent highly so. But Hillary Clinton and mass unpopularity are old pals. The first major attempt to suss out the source of the antipathy, Henry Louis Gates' "Hating Hillary," appeared in The New Yorker in 1996—meaning this idea is now old enough to vote. The thing is, though, Clinton's popularity numbers have never stayed put. She wrapped up her secretary of state gig in 2013 with a 64 percent favorability rating, and even that wasn't peak Hillary—in 1998, at the kickoff of Bill's impeachment, 67 percent of Americans were on her side. Now, we're a polarized people. A third of Americans will always approve of Hillary Clinton, while another third forever will be ready to holler "Lock her up!" But what's with that middle that can't make up its mind? Clinton's spin on her fluctuating favorability is that she's a wooden campaigner whose numbers dip during the election cycle, but a hard worker who forges her way back into our hearts with her sturdy competence. As she said at the Democratic convention of her career in public service, "The service part has always come easier to me than the public part." Fine, she's no natural politician. But a charisma deficit alone isn't enough to turn half a nation against you. What about ethical concerns? Knowing full well the scrutiny they're under, the Clintons have often seemed oddly unworried about appearing too chummy with big donors to their campaigns and charitable work, and a fog of impropriety clings to Hillary even when specific claims are disproven. Certainly no presidential candidate has faced so much congressional scrutiny immediately prior to an election: Republican-controlled committees have been hammering away at Clinton for three years now, first on Benghazi, then on her email usage. And that kind of shelling from the opposition is nothing new—in the '90s, Bill and Hillary Clinton were accused of everything from real-estate shenanigans to outright murder. Hillary might have chosen a less dramatic-sounding phrase to describe the well-financed network of conservative operatives who had coordinated their messages against the Clintons than her much-ridiculed "vast right-wing conspiracy." But their detractors—whether politicians, news commentators or your relatives on Facebook—have shared a singleness of purpose that's unquestionable even if you believe its cause is righteous. And it's come from both sides: Mainstream liberals like The New York Times' Howell Raines and Maureen Dowd were dogged critics of the Clintons' ethical lapses, real or perceived. And yet Bill Clinton has emerged from the battles of the past unscathed: As recently as 2014, his favorability polled at 64 percent. Meanwhile, Hillary suffers the scorn of a reinvigorated left that's retroactively critical of her support for her husband's policies—adopted in the aftermath of the Reagan years, when Democrats were stumbling over each other in their efforts not to appear too liberal. How did Hillary get stuck holding the bag? Let's not dance around the obvious: Hillary Clinton is a woman. Surely it's a double standard that allows Bill to seem like a charming rapscallion who just cuts a few corners, while Hillary is cast as a shady crime boss. 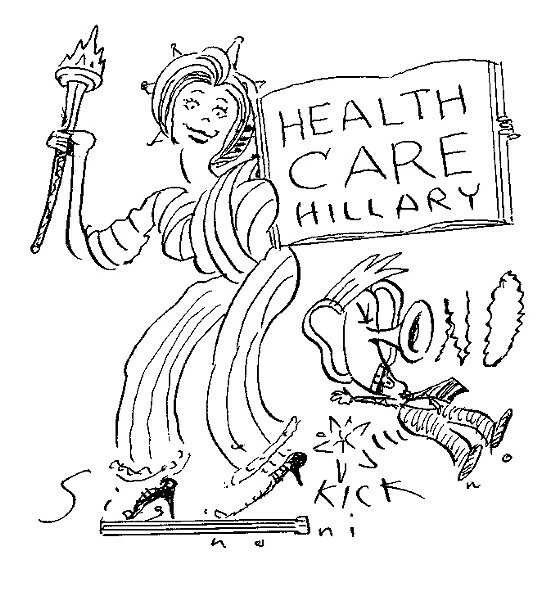 Back in the '90s, as the first working woman to serve as first lady, Clinton initially took a lead role in healthcare policymaking but hit massive turbulence from D.C. traditionalists who thought she'd misread her job description. Such paleo-anti-feminist rancor—and an accompanying rap as presumptuous and pushy—is something that more recently prominent female politicians, like Elizabeth Warren, have largely been spared. None of this is to make excuses for her—politics is a tough game, and a better operator might have handled things more deftly. As that 1996 New Yorker piece suggests, Hillary's always just rubbed plenty of people the wrong way. Then again, "Why doesn't anyone like you?" is a hell of a question for even the savviest politician to field continuously for 25 years. However, friends, we live in wondrous times, and in 2016, Hillary's not even our least popular presidential candidate. Gallup again: 59 percent of Americans don't like Donald Trump, including 42 percent who can't stand him. Fortunately, nobody's writing in to wonder why—I'd never get it all in a single column.